Can a Cough Crack a Rib? In short, unfortunately, yes, if the cough is prolonged, repetitive and compounding underlying bone density issues. Do not be alarmed. 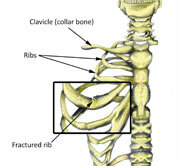 A rib fracture (one rib) is not life threatening, however, can be extremely painful. They typically occur under the breast and a little off to the side of the torso. A patient (age 40) visited us after she had a flu and cough for 8 days week. She said she coughed so much that it make her body hurt. After one particular coughing spell, she explained that she had pain along the torso and along the rib. Again in our office, two days after the initial incident, she felt immediate sharpness and pain when she coughed or when we touched the area. The area was not red, but it was extremely sensitive and tender to the touch. We advised she see her family doctor for examination and imaging. She visited her family doctor after our discussion and had x-rays taken. The next day she came by our clinic to share the results. The x-rays confirmed a hairline fracture along the 5th left rib. The rib was in proper position and would heal naturally on its own. Her doctor also advised a bone density scan. A bone density test enhances the accuracy of calculating your risk of breaking bones. A bone density test uses X-rays to measure how many grams of calcium and other bone minerals are packed into a segment of bone. The bones that are most commonly tested are in the spine, hip and forearm. Doctors use bone density testing to: Identify decreases in bone density before you break a bone, determine your risk of broken bones (fractures), confirm a diagnosis of osteoporosis and monitor osteoporosis treatment. Osteoporosis a medical condition in which the bones become brittle and fragile from loss of tissue, typically as a result of hormonal changes, or deficiency of calcium or vitamin D. Our patient asked if there was anything we could do. Her family doctor felt that some pain medication and follow up with us for pain control therapy would be beneficial. We explained that ice over the area would help with pain control. She asked if we could use laser therapy to assist the soft tissue tenderness. We proceeded with laser therapy treatments which helped with healing of the soft tissue in the area along with tenderness. After 3 treatments within a one week period, her tenderness had decreased 50%. This was exciting for our patient and for us. After an additional 3 treatments of laser therapy and ice therapy over 2 weeks, we were able to improve the condition almost 100%. Our patient was extremely happy with the results. She followed up with us after her bone density test, to advise us that her bone density was in the normal range. Please note that although one rib fracture is typically not dangerous, the same cannot be said for multiple rib fractures. Multiple ribs fractures can be dangerous as they can lead to flail chest or an open chest wound. They usually occur due to trauma, car accidents or falls. The main goals in the treatment of multiple rib fractures are control of pain, support of respiratory function, and stabilization of the chest wall either through mechanical ventilation or surgical fracture fixation. Please seek immediate medical attention if you suspect multiple rib breaks/fracture.